We arrived back in Nairobi on Tuesday, 22-Nov. Since that time, we've been attempting, bit by bit, to get our home ready for regular life. Today we will be hosting our first community group meeting since our return. Many of my hours have also been spent catching up with students of EABST. I've met with several of them already and still have plans to see several more in the upcoming week. It's exciting to see how God has brought us this group of men: wise, godly, and hungry for the Word! Please pray that God would use us inside and outside of the classroom to equip these men to shepherd his church biblically. 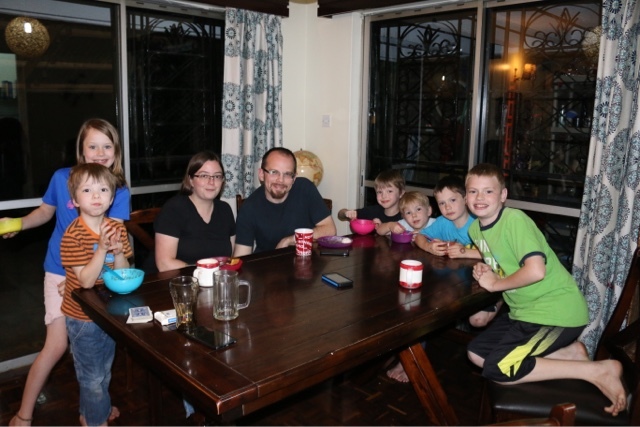 Jenny and I have also enjoyed the chance to host or share meals with our friends here. I also prized the opportunity to attend a dear friend's wedding. We treasure the discipleship relationships God has placed us in here, and we were acutely missing our brothers and sisters from EBC while we were away. It's good to get back into the swing of things. Please pray for mutual building up of the faith as we seek to live out the Christian life together. Today I have been preparing for teaching and possibly preaching opportunities from the Minor Prophets. I am excited about these opportunities and glad to share one of my favorite sections of the Scriptures with the believers here. I am also preparing for EABST courses next term (OT Writings, Orientation, and Ecclesiology). Please pray that these opportunities to interpret and apply the Word would exalt Christ and build up his body. Thank you for partnering with us, especially for your prayers on our behalf. Our stop here in the Toronto airport is giving me a chance to enter a quick update en route to Kenya. After presenting the work at First Baptist Church, Lake Orion. I proceeded to the ETS conference in San Antonio. In past years while on deputation, I have treasured this opportunity to reconnect with friends and professors from seminary. It is also a great chance to hear some good papers in the areas I’m planning to teach in the near future. I certainly have lots to mull over after last week. We were grateful to enjoy time with our family over the weekend. My mom accompanied Jen and the boys as they came up from El Paso. Jen’s parents came over from Syracuse to meet us in Detroit. We enjoyed a turkey dinner, sort of a pre-Thanksgiving Thanksgiving. It’s never fun to say goodbye, but we’re grateful for how supportive our family has been and for the privilege of following Jesus on these paths. We got off this morning without any major issues. Tim Aynes was a huge help to us as we scrambled with last-minute stuffing. Our documents all appear to be in order for now, so thank you for praying about that. Please keep our travels and reintegration into life and ministry in your prayers. Thank you! This last Wednesday we were hopping on the Interstate after a night in a hotel near Phoenix, AZ. I checked our direction before getting on the highway: "I-10 West, good, off we go." Wait, no, after working our way west as far as Malibu, CA, our journey now points east on our way back to our home in Nairobi. We're so eager to return! We spent the last two weeks with Crossway Baptist as I mentioned before, but the Lord also provided opportunities to meet with others as well. 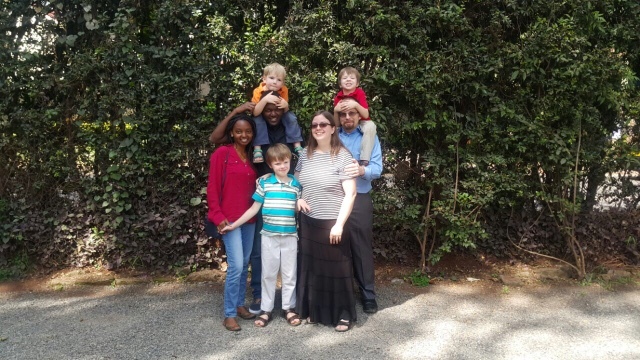 We took a day trip to visit friends in the Bay area, erstwhile members of Emmanuel Baptist in Nairobi. While there, I also had the opportunity to meet with three pastors and discuss our mission to Kenya. Last Sunday evening, I had the privilege of presenting our ministry to Life Point Baptist Church in Apple Valley, CA. If memory serves me correctly, we visited this church originally in 2009. The pastor, Kit Johnson, is a friend from my college days, so it was great to have a chance to catch up with him and his family as well as to reintroduce myself to the church. 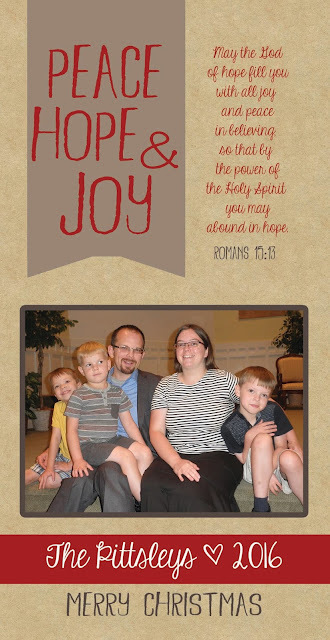 This Sunday I'll be presenting the our ministry to First Baptist Church of Lake Orion. This church has been a dear friend of the work in Kenya, and they partner closely with the Huffstutlers and the Moores, so we're very glad to be able to connect with the believers there and update them on ministry progress. 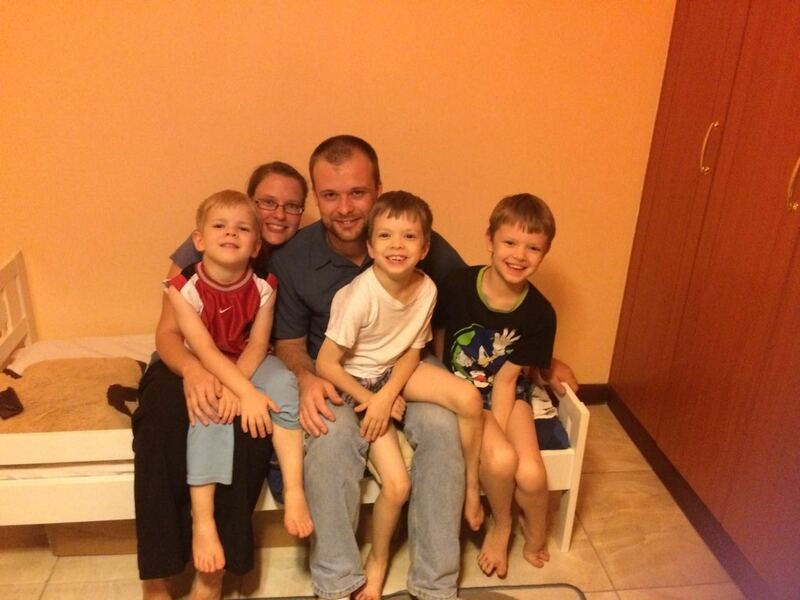 The whole family will be traveling by air within the States this coming week, so please keep us in your prayers. Also we've made a good deal of progress on getting all of our necessary documents together, but there's still work to do there as well. Thank you for your faithfulness in prayer. August is passing us by even more rapidly than July did. It's hard to believe our time here in Michigan is coming to a close. After visiting with Calvary Baptist in Preble, NY, we traveled down to Virginia again. 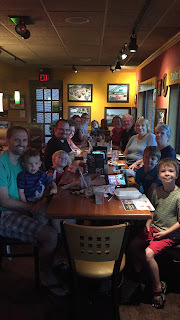 We were able to catch up with close family friends that we missed last time as well as meet with another pastor in the Richmond area. We're grateful to God for the help we received from Grace Bible Church with some car trouble we had while we were there. Once in Michigan we attended family camp with our sending church. It was great to spend a week with the members of InterCity Baptist. Although several of our family members came down with colds while we were there, we were still able to spend at least a meal just about every day with friends and sit under some practical teaching from the Word. 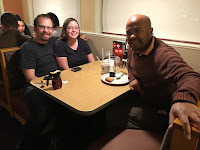 After presenting our work to the whole church last Sunday, we've continued to meet with members of that church as well as leaders of two recent church plants in the Downriver Detroit area. This last Sunday found us at Community Bible Church in Trenton, MI. It was a joy to be with these believers, and our only regret was that we could not spend a much longer time renewing our friendships there. We plan to travel almost 1,700 miles (2734 km) this week, so please keep us in your prayers! We've enjoyed the bustle of the last five weeks since we landed in the States. Our first couple of weeks I was preparing a video presentation report for our time here in the States. 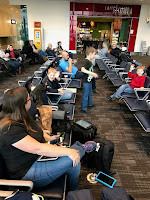 Those initial days gave us the opportunity to get re-acclimated to the Western and Northern hemispheres and to see some of our friends at InterCity Baptist. One thing the kids had to adjust to was the brightness of the sun at bedtime. It's been awhile since they've had a summer outside of the tropics! 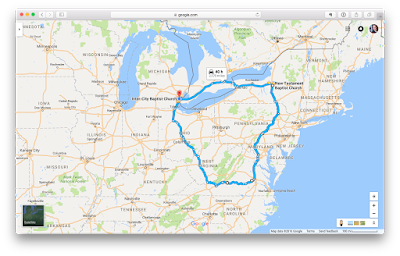 From there we traveled through Canada from Michigan to Syracuse, NY. The boys handled the trip pretty well. It was the longest they have been on for a while. We're grateful for the way the Lord has provided a place for us to stay and for the way we've been able to spend some time catching up with members of various churches. The kids have been able to see Grandma and Grandpa Parker nearly every day! While we've been here, we've visited four churches. 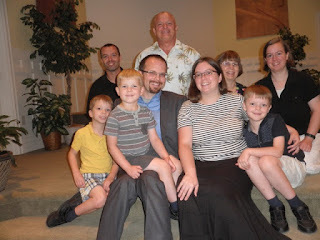 Heritage Baptist was our first church to report to, and we appreciated the welcome we received there: they truly made us feel like partners in the gospel, coworkers on different sides of the globe. Next we went to Faith Baptist. We were glad to be able to participate in their VBS children's outreach as well as spending a Sunday worshiping and sharing a meal with them. 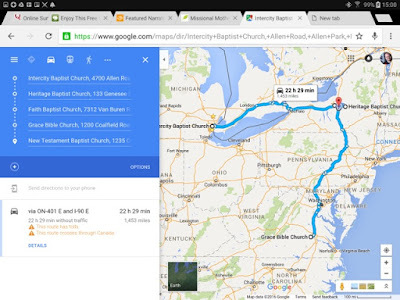 From there, I took a trip alone to be with Grace Bible Church near Richmond, VA. They graciously gave me an opportunity to speak on missions at their first annual men's retreat and report more broadly to the entire church on Sunday morning. It was privilege for me to strategize and discuss missions with these men who are committed to Christ's cause both globally and locally. Finally, we reported to Jenny's parents' church this last Sunday. We have called New Testament Baptist our church in the area for years. It's where I did my pastoral internship coming out of Bible college, and it's where Jenny and I were wed, so they will always be special to us. Thank you for keeping us in your prayers as we travel and serve. Please click here for a printer-friendly version. I'm sitting in traffic on the way to the airport. No, I'm not texting while driving. I'm enjoying a rare break from being behind the wheel as we take this last trip down these familiar roads. God's grace toward us over this term has been nothing short of awesome. As I consider some of the highlights I can't help but place friendships at the top of the list. It is through friendships that we are engaging in our privilege to announce the good news of Christ's victory over sin and death. And it is through friendships that we are mutually discipled to be more like Christ in the context of our beloved church, EBC. Some of our closest friends here are men who have come to EABST to train for ministry. Others are our ministry coworkers—my fellow faculty members. Friendship is part of what makes leaving hard. 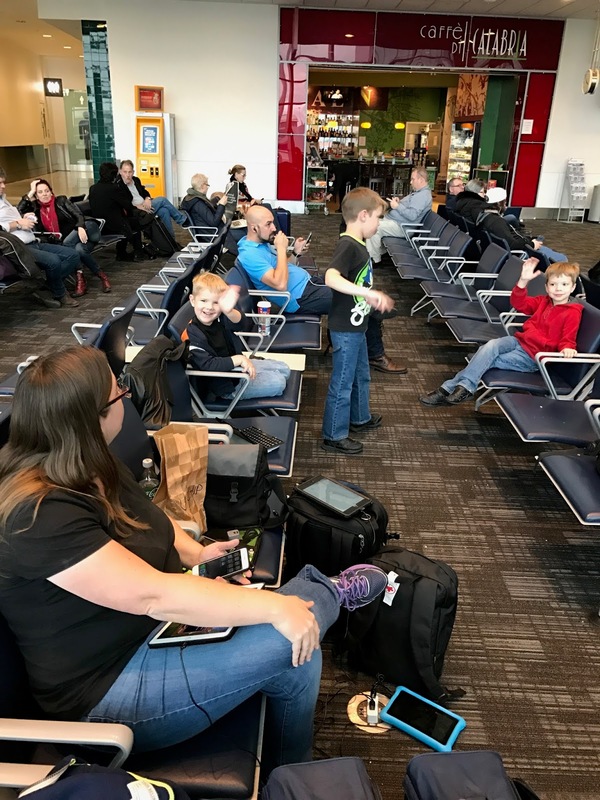 On the other hand, what we're looking forward to most about the States is catching up with friends, ministry partners, and beloved family, so our hearts are divided. Our purpose however is clear and single. The best thing we can do for our friends, the purest love we can show them, is to seek our joy and theirs in knowing Christ and making him known through well-led and well-taught local churches. Please keep us in your prayers as we travel tonight and tomorrow—and as we travel throughout the US over the next several months. Thank you for partnering with us. After several months of prep, the last week or two before the Proclaim Conference was a flurry of activity. 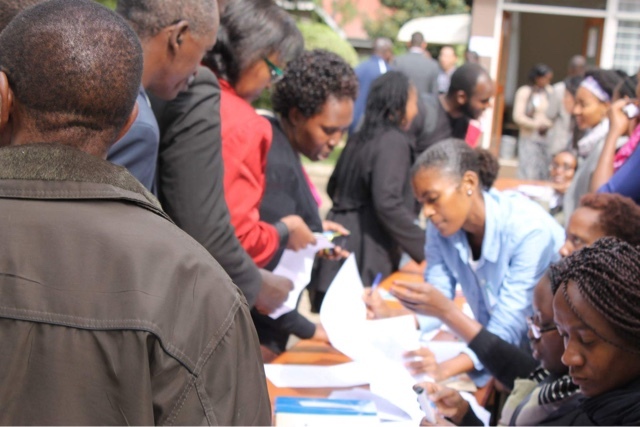 It all paid off though when over 400 participants, including around 100 pastors, came through our gates last weekend. 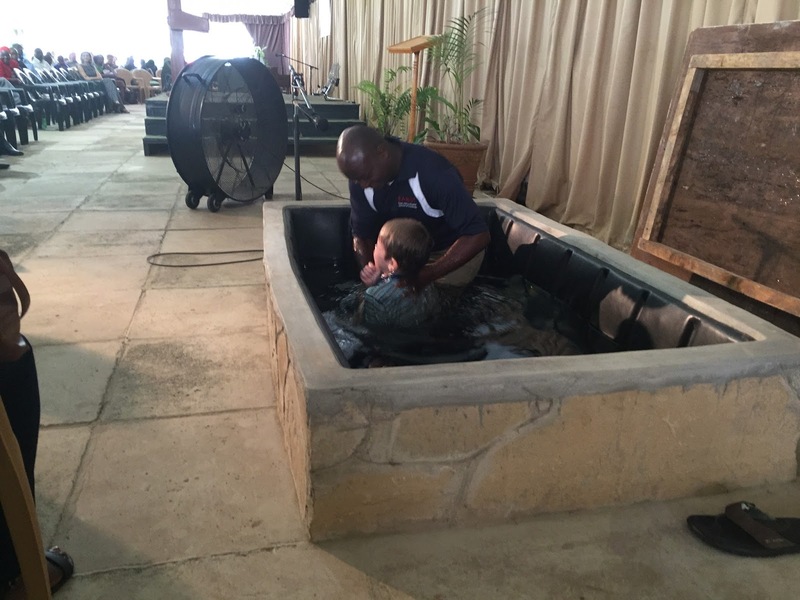 What an incredible privilege and weight of responsibility the Lord has entrusted to us! We're thankful for the solid teaching of our guest and local speakers, for the help of nearly 40 volunteers, and for our stateside church partners as well. 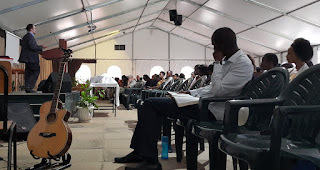 The teachers concentrated on the theme of the proclaimed Word, equipping men to preach expositionally. The volunteers invested hundreds of manhours on registration, food coordination, and info desk work among other tasks. Our partners enabled us to acquire and ship quality resources to give away to pastors and other church leaders and members—and all of you are the ones who keep us here anyway through your prayers and partnership. Thank you! 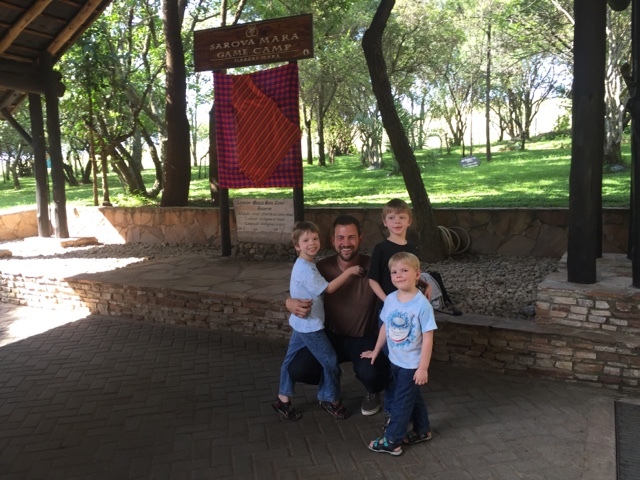 One of the guest speakers, Pastor Mark Brock of Crossway Baptist, invited us along for a quick safari ("safari njema" means nice journey) to the Maasai Mara. This is the first time for our family, and we're enjoying the trip. Yesterday afternoon we were about 10 feet from a lounging lion with only the vehicle doors separating us. We're enjoying God's magnificent creation. 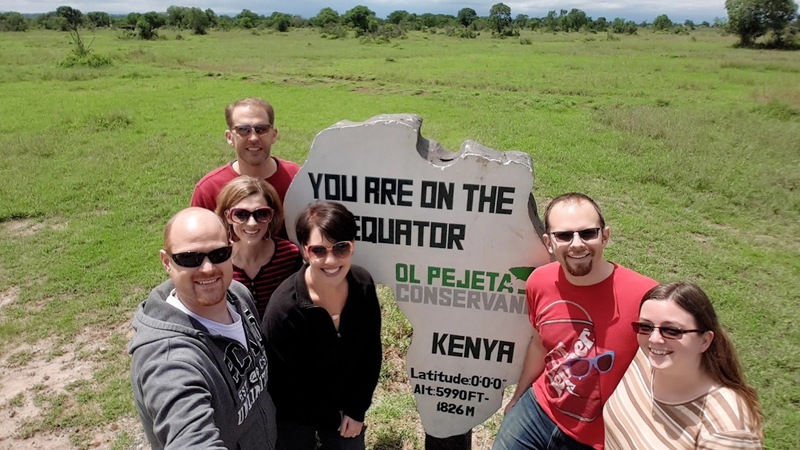 With all class sessions completed last week, we took a long weekend away from Nairobi to take some time to catch our breath before six weeks of intense activity. 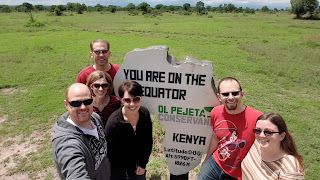 We had a relaxing time and enjoyed seeing jackals, rhinos, elephants, cape buffalos, and several types of antelope. All of the kids stayed back with sitters and enjoyed their break from parents too. One of our church partners recently wrote asking for updated prayer requests. I've included my response here with some minor modifications. (3) that God would grant order, discipline, and peace as we prepare to leave home soon for a five-month stateside ministry assignment. (5) that God would grant each member of our family the humility, gratitude, godliness, and wisdom that we desperately need in order to honor him with our lives. The rains have come. April and May are normal rainy season months here in Kenya. As someone who grew up in the desert Southwest, I always find this a beautiful and exciting time of year. Everything is so green! It's not without its drawbacks. Flooding in the city can endanger homes and lives and make travel prohibitive. As in any city, a change in weather often results in traffic accidents and significant delays. Storms frequently knock out power, and both cable and cellular Internet becomes much more unreliable. Each droplet represents a warning and a mercy: a warning of our fragility in the face of events we cannot control and a mercy that God is providing for our needs. School is winding to a close as all of the teachers will hold their final classes in the next week or so. Please pray for students as they compose their final projects and prepare for their oral exams. Please also pray for the pastors' conference quickly approaching at the end of May. Thank you for your continued partnership! UPDATE: As I wrote this post, the day's rain was really only just beginning. It became increasingly intense over the next hour or two, and while it appears to be calming now, I've heard reports of walls collapsing and fatalities. Please pray for those affected. Jenny and I have enjoyed the change in schedule the past week or two as we have had some out-of-the-ordinary opportunities. 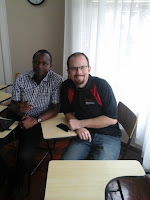 First, two good friends who taught with me in 2011 at CABC in Zambia came up for a visit. It was a pleasure to help them find several items they have had difficulty acquiring there. 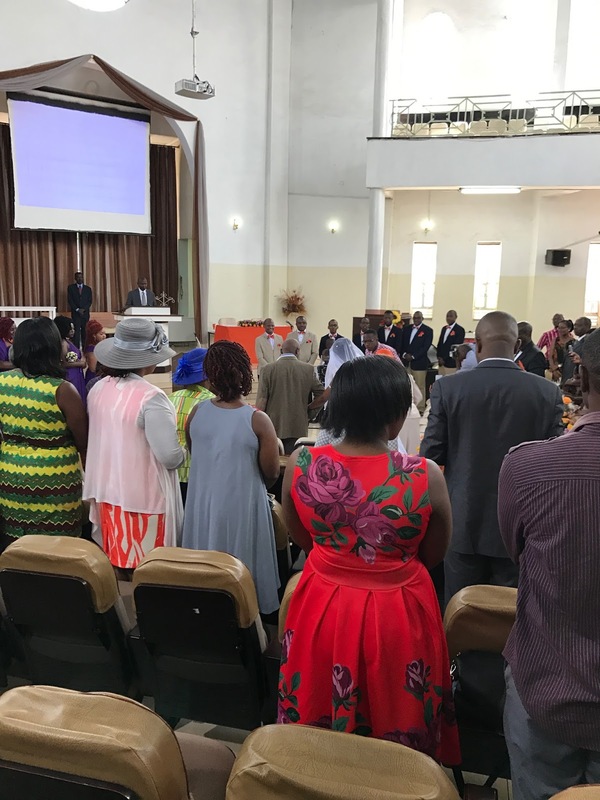 They were an encouragement to us in our work here, and we're excited about future opportunities to serve together in equipping ministers of the gospel in Africa. Second, I had the opportunity to preach at EBC last Sunday and will again this Sunday. This privilege is usually available only once or twice a year, so I'm always glad to grab it. I'm attempting to work through the entire book of Hosea in two sermons, so the challenge has been to capture the general context, the basic structure, and the core message of the book. What has been exciting is to see how God's holy, unconquerable love overcomes Israel's repugnant idolatry and covenant-breaking, both through the forgiveness of sins and through heart transformation. Ultimately, it is the cross that makes this kind of victory over rebellion a reality. His grace is greater than our sin! Please pray for a strong finish for our students. Introduction to Biblical Theology and Interpreting 2 (Intro to Greek and Hebrew) are quickly coming to a close, and oral exams are just around the corner! Thank you for partnering with us in this joyful calling to equip servants to lead in Christ's church in East Africa and beyond. We're back into classes again at East Africa Baptist School of Theology. The Lord has provided a great group of new students. Most of them represent an expansion of our reach beyond our previous circle of contacts, so we're happy to see that the Lord is using us to make an impact in this city. This term, I'm teaching Introduction to Biblical Theology and Interpreting 2 (which could be called Introduction to Biblical Languages). It has been a long-term dream to teach the languages in this context, so it's exciting for me to finally begin. Pray for perseverance and teachability as we seek to honor the Lord by listening carefully to his Word. 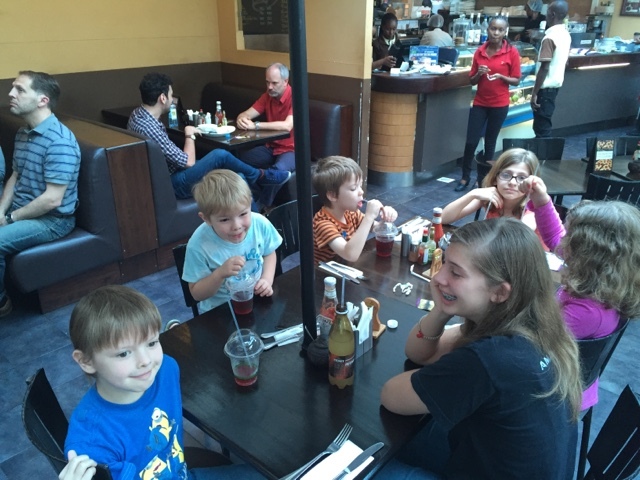 One family update from before the end of 2015 is particularly exciting to us. Our son, Josiah, who recently turned 10, was baptized and accepted by the membership of Emmanuel Baptist Church upon his testimony of faith in Christ. 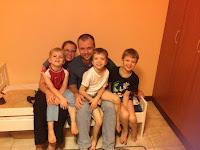 Please pray with us as we seek to continue to disciple and parent Josiah and his brothers wisely. Our God, the One who answers your prayers, is our strength.